It’s time to hear where things stand from the women on the front lines. Established independent female filmmakers will share how gender discrimination does or does not impact them on a per-project basis, whether gender should matter at all, their take on the current movement for change, and what they see coming down the line. 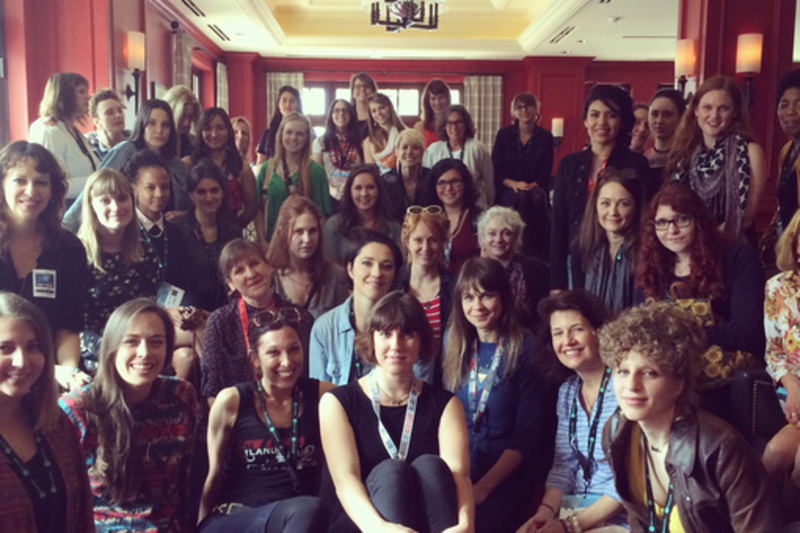 Organized by Film Fatales, a global collective of female feature directors. Janicza Bravo was raised on an army base in Panama City, Panama. She moved to the US two decades ago. She studied directing and design for theatre at NYU. Most recently she made Filmmaker Magazine's 25 New Faces of Film. She's mounted plays in the states and abroad. Her film work has screened at BAM, Carnegie Hall, Sundance and SXSW. Judi Krant's comedy feature, MADE IN CHINA, won the SXSW Grand Jury Award for Best Narrative Feature and the first ever Chicken & Egg Award for Emergent Female Director (now called the Gamechanger Award). The film went on to win many national and international awards on it's festival run. It is distributed by IFC. Krant has worked as a content creator and story teller for many years, optioning screenplays, producing web shows, directing national commercials, and making music videos. She taught screenwriting in NYC at the New York Film Academy. Kat Candler’s latest feature film, Hellion premiered at the 2014 Sundance Film Festival in U.S. Dramatic Competition. Her previous films have screened at Sundance, the Los Angeles Film Festival, San Francisco International Film Festival, SXSW, Slamdance and on PBS. Candler is a film Lecturer at the University of Texas. Leah Meyerhoff is an award winning independent filmmaker whose debut feature film I BELIEVE IN UNICORNS was released theatrically in 2015 after premiering at SXSW, winning the Grand Jury Prize at the Atlanta Film Festival, and additional awards from IFP, San Francisco Film Society, Tribeca Film Institute, Nashville Film Festival, Woodstock Film Festival and the Adrienne Shelly Foundation. A New York Times critic’s pick, I BELIEVE IN UNICORNS was described by the Village Voice as “an honest, complicated portrayal of adolescent female sexuality on film” and by The Skinny as "a beautiful 16mm nightmare and one of the most visually accomplished feature debuts of late.” Meyerhoff's previous short films have screened in over 200 film festivals, won a dozen awards, and aired on IFC, PBS, LOGO and MTV. She has been shortlisted by the Student Academy Awards and the Gotham Awards. Meyerhoff is a fellow of IFP’s Emerging Narrative Labs and Narrative Finishing Labs. She was one of ten filmmakers chosen to participate in the Emerging Visions program at the New York Film Festival and one of eight chosen to participate in the All Access Labs during the Tribeca Film Festival. Meyerhoff is the founder of Film Fatales, a non-profit organization dedicated to supporting female filmmakers, with dozens of local chapters around the world. She holds a BA in Art-Semiotics from Brown University and an MFA in Directing from NYU’s Tisch School of the Arts. Logan Kibens is a Writer/Director whose work integrates visual artistry with narrative, character driven storytelling. She is a Sundance Screenwriters Lab fellow and recipient of the HBO/DGA Directing Fellowship (working on shows such as TRUE BLOOD, ENTOURAGE and THE NEWSROOM). Logan was selected as one of Film Independent’s Project Involve fellows after completing her CalArts thesis film, RECESSIVE. Her films have screened at museums and festivals such as The Chicago International Film Festival, Outfest, Frameline, Brooklyn Museum of Art, ZINEBI and REDCAT among others. She is an award-winning projections designer for theatre and dance with designs at The Goodman, Steppenwolf, and The Washington Opera to name a few. Her original screenplay OPERATOR is supported by the Sundance Institute, Film Independent, and the Alfred P. Sloan Foundation. Logan recently completed her first feature OPERATOR, which will be premiering at the 2016 SXSW Film Festival.